The Blades of the Darkmoon, a PvP-focused covenant, are the disciples of Dark Sun Gwyndolin who hunt sinners as blue phantoms. Using the Blue Eye Orb to invade the worlds of sinners in any multiplayer area. While in Anor Londo, equipping the Darkmoon Blade Covenant Ring will automatically have the player invade the worlds of those who have killed Gwynevere, Princess of Sunlight. The host will not be notified of the invasion, and the ring will work even if the sinner has received absolution. A successful invasion rewards the invader with a Souvenir of Reprisal that can be used to increase one's rank within the covenant. Unlike the Darkwraith and Forest Hunter covenants, Blade of the Darkmoon members cannot be indicted for their invasions. 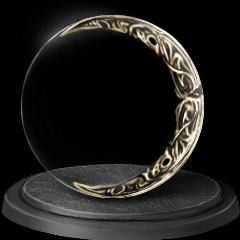 Ability to invade the worlds of sinners by using the Blue Eye Orb or Darkmoon Blade Covenant Ring for a Souvenir of Reprisal and souls. Darkmoon Blade, a miracle that applies magic damage to enchantable weapons. The Darkmoon Talisman, which has the highest magic adjustment of any talisman. Equipping the Darkmoon Seance Ring, found in The Catacombs. Killing Gwynevere, but Gwyndolin will be hostile to the player until they receive absolution. The covenant is located in the Darkmoon Tomb, reached by lowering the spiral tower in Anor Londo to the lowest level. Approaching the Gwyn statue with either of the two previous conditions met reveals the path. As long as Gwyndolin is alive and non-hostile, kneeling on the mat in front of the fog gate will have Gwyndolin give the choice of joining the covenant. Offer a Souvenir of Reprisal to Gwyndolin to level up in the covenant. *Each reward can only be granted once per character. If the player abandons the covenant, the number of offerings made to the covenant will be halved (lowering their rank within the covenant appropriately). The Blue Eye Orb and Darkmoon Blade cannot be used until rejoining the covenant. If the player enters Gwyndolin's fog gate, they will be expelled from the covenant (acquiring PvP sin) and receive all the consequences of abandoning the covenant as well. Killing Gwynevere or the Lady of the Darkling while being a member of the covenant will not count as betrayal. However, killing Gwynevere makes Gwyndolin hostile and unable to be spoken with until the player receives absolution. REMASTER NOTE: With the ability to change covenants at a bonfire, please be aware that if you kill Gwyndolin, you cannot change back to this covenant at a bonfire, you will still need to continue on to the next NG cycle in order to rejoin the covenant.